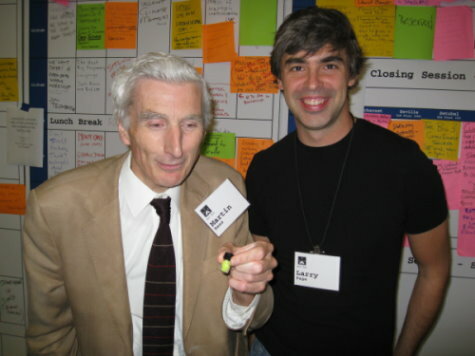 I had a short discussion at this year’s SciFoo conference with Larry Page, Kevin Grazier, and cosmologist Martin Rees (he’s holding one of my latest products, a vial of Kryptonite). We were talking about whether there was any reason to believe that life did not arrive from outer space instead of originating on Earth. Martin brought up the ideas of his mentor, Fred Hoyle, on the subject of panspermia, mentioning that since Hoyle believed in the Steady State Theory as opposed to the Big Bang, there was much more time for panspermia to happen. Time is an important factor in the question of whether life originated on Earth or in space. With enough time, life could spread around the universe, and end up being quite common. Whether life is common has other implications relating to the question at hand, however. If life commonly evolves whenever the conditions are right, then it probably evolved on Earth, perhaps many times (this is in fact the subject of one of the talks at SciFoo). If life is very common, then it may have arrived from space many times, as well as evolving on Earth many times. But do we have any evidence that life is that common? We have been to the moon and Mars looking for life, and so far no place we have looked in the solar system seems to have as much life as the Earth does. Of all the places in the solar system to expect life to have evolved, the Earth looks to be the most likely. We don’t yet have the technology to look for life on other solar systems to see if it is common. And so far, we have not heard from any extraterrestrial civilizations. So what are the chances of life arriving from outside the solar system if life is not inevitable whenever the conditions are right? What if life is rare? As we look farther out into space, the odds of finding an earthlike planet go up as the cube of the distance from Earth. The time it would take life to get to Earth from another planet only go up linearly with distance. So if bacteria inside a chunk of rock blasted away from a planet by a meteorite could live forever in space, the odds of life reaching Earth don’t look so bad, if we look far enough out. This is where having infinite space and infinite time to travel helps. But in a Big Bang universe, we only have 13.73 billion years to play with, minus the 4 billion years life has been on Earth. So how far could life have travelled in 10 billion years? The fastest meteors travel about 160,000 miles per hour. Whether life in such a meteor could survive hitting the atmosphere is questionable, but we will use that number. Travelling at that speed for 10 billion years, a meteor could travel 2.3 million light years. That’s about as close as the Andromeda galaxy, one of the closest to the Milky Way. So we should probably assume that no life would have come from outside our own galaxy. There are about a hundred billion stars in the Milky Way. Perhaps 10% of those are stable enough, far enough away from supernovae, and have enough heavy elements to support life. If 30% of them have planets, we have 3 billion places where life might have evolved. That’s a big number, but we still have to get life off of that planet, and onto Earth. What are the odds that an asteroid would hit a planet with life, blast a rock from it, and that rock would then hit Earth? Space is pretty big. All of this still presumes that life can last billions of years inside a meteor travelling through space. Suppose there are 100 trillion cells inside the meteor (I have about that many in me). If half of them die each year, there won’t be any left in a thousand years. If somehow the life in the meteor could live for a million years in space, it could only travel 238 light years before it died. That narrows down the number of stars that could contribute to life on Earth. There are about 200 stars within 25 light years of Earth. Within 250 light years, we should expect about 200,000 stars. If we stick with 3% of those being suitable for life, we have 6,000 places where life could evolve and survive being blasted to Earth. I would bet that the odds of a meteor taking life from one of those places to Earth are less than 6,000 to one. Thus it seems to me that it is more likely that life evolved here on Earth than that it came from outer space. Categories: Astronomy, Biology, Chemistry, Genetics, Physics, Space, Technology.